Matching set of JESSICA Shoe, LIMA bag and COMO purse. Flattering JESSICA features clean lines and fabric uppers for a classic style with a fun twist that will make you want to dance! 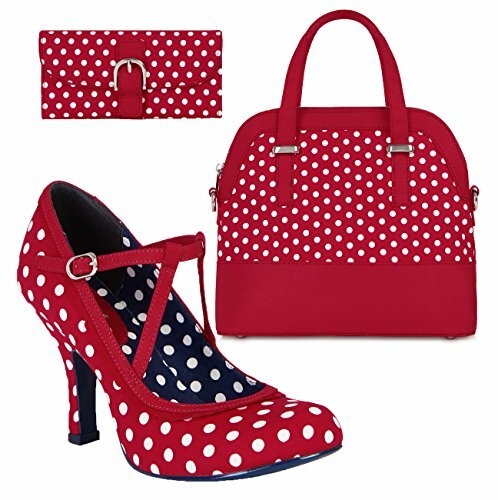 Red and white spots which matches perfectly to bag style LIMA and COMO purse. Upper: Textile Lining: Textile Sole: Man made materials Heel Height:90mm. Large shopper shaped LIMA bag has spotty body, contrast faux suede trim and bottom. Outer: Textile Lining: Textile. An exciting new addition this season, Ruby Shoo have also created this adorable matching purse. With fold over front, lots of pockets and zip compartment, and feature buckle the COMO is practical as well as cute. Matching set of JESSICA Shoe, LIMA bag and COMO purse. Flattering JESSICA features clean lines and fabric uppers for a classic style with a fun twist that will make you want to dance! Red and white spots which matches perfectly to bag style LIMA and COMO purse. Upper: Textile Lining: Textile Sole: Man made materials Heel Height:90mm.